Chanukah, the eight-day Jewish Festival of Light commemorates the re-dedication of the Holy Temple in Jerusalem, begins this year on the night of Dec. 11 for Jews in Israel and around the world. Eight nights of Chanukah, Jews light candles on a chanukiah- a nine branched candelabrum with eight candle holders representing eight nights of the holiday. 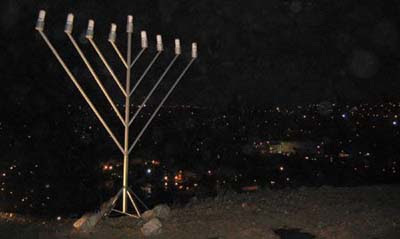 The chanukiah is often erroneously referred to as a Menorah, a similar candelabrum, but with just seven candle holders. The celebration of Chanukah dates back to about 165 BCE, when a band of Jews, the Maccabees, fought against the Seleucid Empire which then occupied the land of Israel and suppressed the practice of Judaism. After defeating the Seleucids and reclaiming the Temple, the Maccabees discovered there was only enough oil to light the menorah there for one night. The Talmud tells us that the Chanukiah of the Temple was to be lighted by a special pure olive oil, which was required to burn through the night every night. But, the Maccabeans found only a little can of olive oil (pax shemen) that had only enough oil to burn for one day and not for eight. Miraculously, the one little oil can burned for eight days, the time needed to prepare a fresh supply of oil for the Menorah. An eight-day festival was declared by the Jewish sages to commemorate this miracle ( nes). We continue celebrating this miracle every year for eight nights, starting on the 25th day of Kislev (December 11 this year). During Chanukah, Jews traditionally eat fried foods such as sufganiyot (jelly-filled doughnuts) and latkes(potato pancakes) to recall the miracle of the oil. 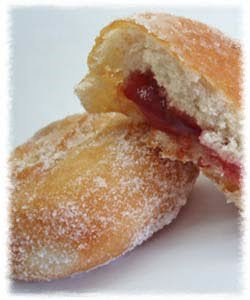 Sufganiyot are especially popular in Israel. Many Jews also play a game by spinning a square top called a dreidel (Yiddish) or s’vivon (Hebrew), inscribed with one Hebrew letter on each side. The letters are an acronym for the phrase “A great miracle happened here” or “there,” depending on whether the players are in Israel or the Diaspora. Chanukah is the Festival of Light, of bringing light to the Temple and to the hearts of the people. Yom shel or, Have a day of light! Happy Chanukah to you Linda, and all your family!